Those words are by Malcolm Guite - a poet and priest - and they take us to the heart of the mystery that we celebrate today: the regal baby born in squalor, the re-imagining of God from local religion to the life of the whole world, and our inbuilt desire to search for meaning, for joy, and a need to worship. Worship lies at the very heart of the journeying of the Wise men. These astrologers/astronomers from other lands and cultures have their attention drawn to the God of Israel, to see the new thing that He is doing. They are so struck by God’s power over the world so as to be able to reorder the stars to reveal His glory, they set out to worship him. We stand on the cusp of a new year and as people from different places and communities, we too have our attention drawn to the God of Israel, to continue to see the new thing that He is doing in our midst, and so we gather here to worship Him. Let’s not lose sight of these Wise men though. Like us so often, they began their Godward journey purposefully and with good intention, but they get distracted. Looking for the Jewish Messiah, God’s coming king, they get distracted by royal palaces, fine robes and the trappings of regal power and influence with Herod. Yet, as they sought to worship God come to us, heaven in the ordinary, it is God Himself who refocussed their vision away from thrones in palaces to the glory filled thrones of a manger and a cross. Let’s also not lose sight of the strange gifts they travelled with so far to give. These highly prized gifts reveal as much about the baby who would recieve them as the givers themselves. The gift of gold brought to honour a king - acknowledging His might and power. The gift of frankincense brought to honour God - acknowledging His holy presence. The gift of myrrh brought as a healing balm or to embalm the dead. The mostly costly of gifts, protected carefully with their lives in transit over many months and many miles. In giving, the child is revealed as God’s king with His might and power. In giving, the child is revealed as a priest offering the world to God and God to the world and in so doing forging something new. In giving, the child will offer healing to many and indeed will offer their very selves, their life, for the healing of the nations. Let’s not lose sight of the reaction of these Wise men as they reached the place of the presence of the Christ child. They were overjoyed as they arrived at the end of their journey, it’s fulfillment and purpose. They knelt in humble obedience, acknowledging who they were and who He is, and they offered Him from their own riches, their very selves. Friends our worship is not a series of rapid one-off sorties we individually make into Divine territory, at best, on a weekly basis. Our worship is the journey we make through life to God in Christ. Like the Wise men, it should be guided and purposeful and not a meandering. It is not just about a particular place, a particular time, for however long, but an orientation of our hearts to discovering God for ourselves. The Wise men saw the star and followed no matter for how long or how arduous the journey. What do we expect as we worship? The Wise men, expected to find God Himself doing a new thing, present in their midst, in the Messiah. Do we gather for worship with the same expectancy? Do we joyfully set out in worship ready to meet Jesus the King? 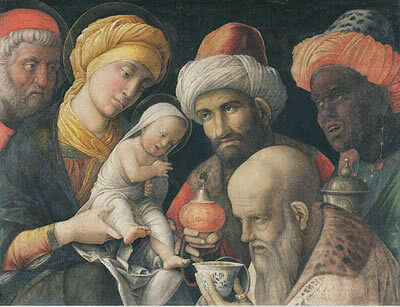 The much travelled and treasured gold, frankincense and myrrh were expensive and will have cost the wise men much. Similarly, our worship must be the very best singing, interceding, playing, praying, & preaching that we can offer. It must cost us time, effort and talent to prepare and offer because we are offering it God and it is all we can offer Him - from ourselves. It doesn’t seem possible that I have been your Priest in Charge for some six months or so now. Over that time we have worshipped, prayed, read, learned and discovered together and there is still much to do and a way to go together and with God. When I first came to you, I said that things wouldn’t change too quickly and I hope you feel that has been the case. I’m also on record as saying that when change did come, we would talk about it, pray about it and decide together a way forward. Over the time that I have been with you I have been ably and capably supported in leading worship by willing and gifted priests like David Smith, Martin Bannister and Charles Parry and many others lay and ordained. I am very thankful for their ministry. I have become aware that the pattern of worship that we currently have is only providable with the help of others. As your Priest in Charge I am unable to worship with you all on any given Sunday. I cannot preach and preside at two services most Sundays at 9.00am for example. We need to have in place a pattern of worship that is providable by me. Following the PCC meeting next week, we will try to discern a pattern of worshipping life that meets our needs and is providable by me. I have ideas as to how we could do this, but I don’t have all of the answers and I will not just drive through what I want. We are Christ’s church here together and we will seek a way forward together. None of us like change, and perhaps especially in things that matter to to us, but I hope that you see the need to look at these matters afresh. If you have ideas as to how we can have a pattern of worship on Sundays across the parish that I can provide, I would like to hear from you. We will have a period of consultation regarding this matter which will run from 14th January-18th March 2012. If you have any suggestions as to how we can worship together in the churches of the parish with me leading you, and build up our friendships and community together, please let me know by letter or email only. In the meantime please do continue to pray for me and each other as we seek to follow where God is leading us. Our worship should be like Gold - for the king, regal, our very best offered, in humble obedience. Our worship should be like Frankincense - to God and for God alone, mysterious, otherworldly, spiritual. Our worship should be like Myrrh - that heals our hurts, renews and restores us, refocussing our lives on God’s purposes for us and His world. Worship must not be about embalming the dead and dying - older congregations in decreasing numbers, the church becoming some sort of cultural museum piece of a bygone era; nor should it be about rigid regal formality - worrying more about the mechanics of how it happens that we forget for who it happens; nor should it be so heavenly minded as to be of no earthly use - sounding and looking beautiful on the surface but failing to draw us closer to Him whom we worship. Our worship must be about offering life in all it’s fullness through an encounter with God himself, always in surprising ways and sometimes in surprising places. Amen.